The TBI 200 su is designed to give you years of listening pleasure.Its small compact physical signature coupled with its high efficiency class AB design operates with vanishing low distortion supplying 150 W to a single TBI™ Bass Extension Module or 200W if two modules are connected. 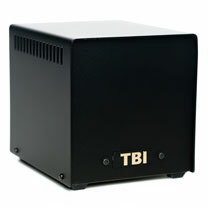 The extremely flat amplifier response ensures that maximum signal transfer occurs regardless of the bass module used. 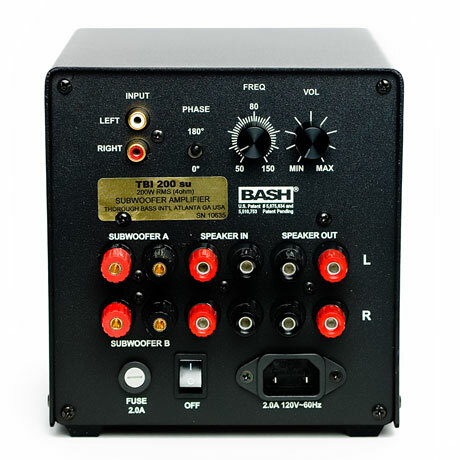 The patented TBI 200 su has a full complement of controls to allow for complete integration with your mains. This unit also features a high pass crossover when you use the speaker level to input the signal to the amplifier. The fixed 70Hz crossover point relieves your monitors from excessive low bass operation usually reducing IM distortion at higher levels.